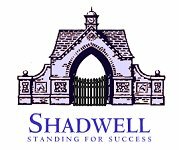 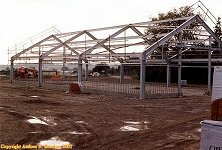 In 1995 Hall and High House farms were purchased by Sheikh Hamdan Al Maktoum as an addition to his Shadwell Stud enterprise - a part of his international racing empire, with its UK operations base at Thetford, Norfolk (home to the famous Nashwan). 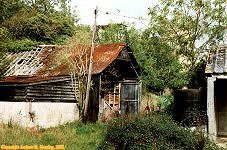 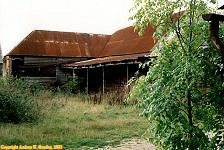 The land had previously been used for both arable and dairy farming, and by the time of purchase the Hall Farm site had fallen into a fair degree of disrepair (as can be appreciated by these photographs). 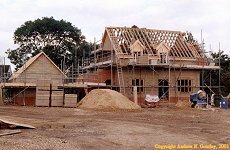 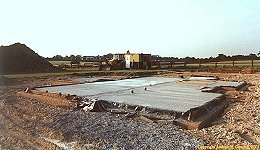 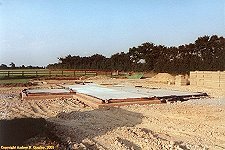 Following several years of protracted negotiations with the local planning authoritiy, construction finally commenced in earnest in the spring of 2000, (with a deadline for completion around six months later). 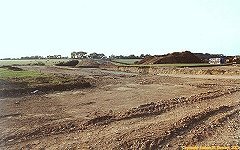 The final plans contraversially included two new dwellings, one of which is situated in a "green field" site ( towards the southern end of Kettlebaston Field), with an adjoining road network. 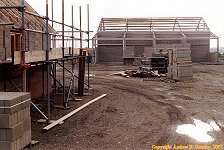 Despite the appalling weather conditions, (the wettest twelve months period since records began in 1697), the main building work was finished roughly on schedule. 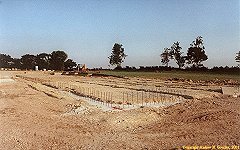 However the landscaping program did not even commence until 2001. 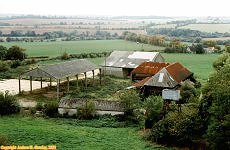 The complex received it's first resident horses on 25/4/01, (some brood mares and foals were housed in the paddocks during 2000, but without stabling), having abortively started to introduce them earlier - cancelled due to the Foot & Mouth epidemic.